Short dough crust with matcha green tea cake, raspberry jam, matcha green tea cream and orange passion fruit jelly. Topped with green chocolate curls and fresh raspberries. Chocolate cake layered with salted caramel cream center, dark chocolate mousse and garnished with chocolate chards and gold leafing. Chocolate cake layered with Oreo cookies, dark, milk, and white chocolate mousse fillings. Topped with dark chocolate fans. A classic Italian square shaped dessert made with layers of coffee rum soaked ladyfinger sponges, mascarpone cream mousse, dark chocolate shavings, and dusted with powdered sugar and cocoa. Chocolate cake with orange cream and dark chocolate mousse filling and garnished with dark chocolate curls and candied orange peel. Yellow cake with a soft black currant cream filling and fresh berries and gold leaf garnish. 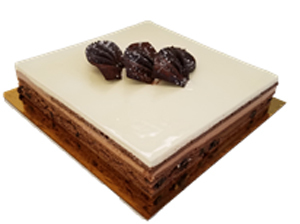 A stripped jaconde band wrapped around a chocolate almond cake and filled with a layer of chocolate mousse and a layer of cappuccino cream. Garnished with cocoa powder and an apricot glaze. Chocolate cake with dark chocolate mousse and a hazelnut cream center. Garnished with disks of roasted hazelnuts & chocolate. Chocolate cake layered with raspberry jam, filled with luscious dark chocolate mousse, and finished with apricot glaze, chocolate curls, powdered sugar and cocoa. A generous center of dark chocolate mousse sandwiched between chocolate sponge layers soaked in raspberry syrup, chocolate mousse finish, decorated with candied chopped almonds, dusted with cocoa and powdered sugar. A signature polka dot jaconde band wrapped around a yellow cake filled with a rich chocolate mousse and vanilla filled cream puffs. Garnished with vanilla filled puffs. 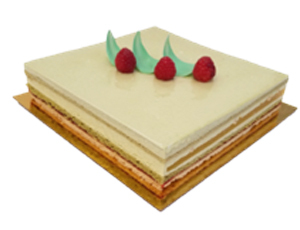 Square shaped cake made with layers of white cake, hazelnut cake, raspberry jam, and mango-passion fruit mousse. Finished with apricot glaze, diced mango, fresh raspberries and dark chocolate dots. Chopped walnuts baked in white sponge layers, coffee cream filling, wrapped in a delicate chocolate shard Madeleine sponge. Finished with apricot glaze, candied walnuts, dark chocolate ribbon streamers, and a light dusting of coffee granules and powdered sugar. Our Dulce de Leche cake is a traditional Argentinean classic. 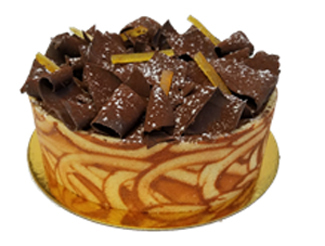 An 8” chocolate genoise, Dulce de Leche cream filling, wrapped in a jaconde chocolate oval pattern, apricot glaze finish and caramel polka dot drops. Garnished with two chocolate tuiles. A white sponge cake with layers of lemon mousse filling, finished with white chocolate shavings and garnished with raspberries. 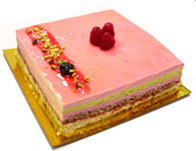 White genoise between layers of mixed berry mousse and mango orange mousse. Wrapped in an orange polka dot pattern jaconde. Finished with apricot glaze, fresh blueberries and diced mango. A white sponge cake with layers of mixed berry mousse, wrapped in a raspberry jaconde, garnished with fresh assorted berries and finished with apricot glaze. Layers of chocolate, white and rum soaked mado (hazelnut ) sponges with a layer each of raspberry jam, coffee mousse and chocolate mousse, dark chocolate velvet finish, garnished with chocolate dipped meringue kisses and fresh fruit. One of the few “square” cakes in the line. 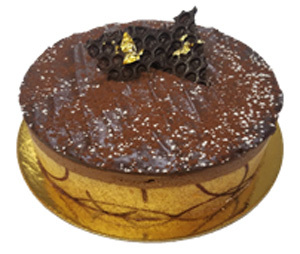 A classic French dessert of jaconde cake soaked with coffee syrup and filled with rich coffee butter cream and dark chocolate mousse, finished in a dark chocolate ganache, dusted with cocoa powder and garnished with a touch of gold leafing. 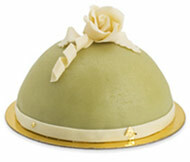 Our dome shaped Princess Cake is Gerhard’s interpretation of the traditional Swedish classic. White sponge cake, raspberry jam, vanilla cream, and covered in green velvet marzipan. Garnished with a hand made white chocolate rose and touches of gold leaf. Layers of white genoise sponge and raspberry mousse wrapped in delicate bands of white genoise and raspberry jam. Garnished with fresh raspberries, white chocolate shavings, and lightly dusted with powdered sugar. Square shaped cake made with layers of hazelnut sponge, raspberry jam, white cake sponge, pistachio crème brulee, and raspberry cream. Garnished with apricot glaze, pistachio pieces, a blueberry, and ripe red raspberries. Layers of exquisite flavors and Euro design. Chocolate sponge layers soaked with kirsch syrup, layers of sweet whipped cream and sour cherries, sweet whipped cream finish, and garnished with chocolate paillettes, sour cherries, chocolate shavings, and powdered sugar and cocoa. Chocolate sponge base filled with pear mousse, poached pear and candied walnut pieces, wrapped in a chocolate stripe pattern jaconde. Finished with apricot glaze, pear wedges, candied walnut pieces, and white chocolate chards. Layers of ripe red strawberries, white sponges, filled and topped with exquisite cream, and garnished with sliced strawberries, toasted almonds and powdered sugar. Enjoy a taste of the tropics. An island of coconut dacquoise discs, layers of macadamia nut crunch and pineapple-rum compote, coconut mousse filling, wrapped in a Madeline sponge with a generous coating of toasted shredded coconut, apricot glaze finish, garnished with chocolate chards, cocoa powder and macadamia nuts.